Critical Limb Ischemia (CLI) represents a complex pathologic state characterized by extensive and long-segment arterial occlusive disease, multiple vessel involvement, frequent calcifications, and microcirculatory disturbance affecting the pedal loop and cutaneous perfusion. Given this generally hostile environment and a high propensity for recurrent stenosis, there remains controversy regarding the optimal method of revascularization in symptomatic patients: surgical bypass, or endovascular therapy. On the surface, surgical bypass is potentially more invasive than endovascular approaches (figure). However, proponents of bypass cite the Balloon Angioplasty versus Surgery for Ischemia of the Lower extremities Trial (BASIL) (1). BASIL evaluated 452 patients with limb ischemia, although only a minority actually received treatment randomization, and concluded that surgery was better in patients with more than 2 years anticipated survival. Overall amputation-free survival (AFS) was approximately 70% in both treatment cohorts. However, polytetrafluorethylene grafts (PTFE) had an almost 40% lower amputation free survival at five years compared to saphenous vein bypass, and of the 85% of patients who were not suitable for randomization the principle reason was absence of a viable conduit for bypass. Endovascular therapy was preferred in patients with lower anticipated survival, and was associated with fewer ICU days and, as a result, lower costs. BASIL Enrolled patients from 1999 to 2004. In the decade since the BASIL trial was completed, numerous additional devices and strategies have emerged for the treatment of CLI pts, and BASIL may therefore not necessarily reflect contemporary outcomes with endovascular therapy. Single device trials have found comparable AFS rates. In the Excell Trial evaluating below knee bare metal stents, amputation was avoided in 70% of Rutherford 6 patients, and nearly 100% of Rutherford 4 patients at 12 months (2). Primary patency for drug-eluting stents has ranged from 80-85%, albeit for short lesions (3-5). Atherectomy has reported one year patency rates of 78% using the Silverhawk Device (Covidien, Mansfield, MA), and 66% for occlusions averaging 10 cm in length (6). In the Calcium 360 trial, orbital atherectomy (Diamondback, CSI, Minneapolis MN) was associated with a less than 7% one-year target lesion revascularization (TLR); TLR rates were 20% in the angioplasty alone arm (7). Finally, recent drug coated balloon data has also supported highly acceptable patency rates; initial experience with infrapopliteal paclitaxel coated balloon angioplasty for long tibial lesions found 3-month restenosis in one-quarter of patients, complete wound healing in three of four, and limb salvage in more than 95% (8). What do comparative studies inform us regarding the relative merits of surgery or endovascular therapy? In a retrospective analysis, Zhan et al found equivalent improvements in limb perfusion as measured by toe pressures at a mean follow-up of 13- (surgical group) to 15- (endovascular group) months. 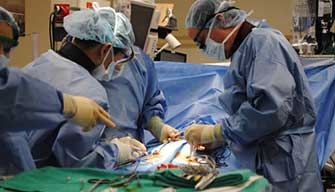 Major amputation was 11% in both treatment cohorts (9). A propensity-score analysis of 1023 CLI patients compared 208 matched pairs of patients with follow-up out to five years following surgery or below-knee angioplasty. Equal benefits were reported in both groups for repeat revascularization (21% surgery, 18% endo), subsequent bypass (5% vs. 12%), and major amputation (19% vs 17%) (10). This data and changing patient demographics since the BASIL trial have resulted in endovascular therapy being adopted as a first-line strategy in traditional surgical groups. One recent study reported endovascular therapy as the initial treatment in 70% of patients referred for surgical evaluation (11). An evaluation of 295 endovascularly-treated and 138 bypass patients (1/2 with autologous vein grafts) found no differences in primary-, assisted-, or secondary patency, amputation-free survival or limb salvage. However, procedural mortality in the surgical group was more than double (6.0 vs 2.8%) (11). The currently enrolling Best Endovascular Strategy (BEST-CLI) trial, sponsored by the National Institute of Health, will provide additional and important data regarding long-term measurable outcomes in CLI patients randomized by treatment allocation. Results are not expected for at least five years. However, as with all large prospective randomized-controlled trials, a critical review will be necessary to determine the generalizability of the BEST-CLI results due to the large potential for randomization bias. For now, there is strong support for endovascular therapy first in CLI patients. Adam DJ, Beard JD, Cleveland T, Bell J, Bradbury AW, Forbes JF, Fowkes FG, Gillepsie I, Ruckley CV, Raab G, Storkey H; BASIL trial participants. Bypass versus angioplasty in severe ischaemia of the leg (BASIL): multicentre, randomised controlled trial. 2005 Dec 3; 366(9501):1925-34. Scheinert D, Katsanos K, Zeller T, Koppensteiner R, Commeau P, Bosiers M, Krankenberg H, Baumgartner I, Siablis D, Lammer J, Van Ransbeeck M, Qureshi AC, Stoll HP; ACHILLES Investigators. A prospective randomized multicenter comparison of balloon angioplasty and infrapopliteal stenting with the sirolimus-eluting stent in patients with ischemic peripheral arterial disease: 1-year results from the ACHILLES trial. J Am Coll Cardiol. 2012 Dec 4; 60(22):2290-5. McMillan WD1, Leville CD, Long TD, Gomes M, Groffsky JL, Schultz SR. Drug-eluting tibial stents: objective patency determination. J Vasc Interv Radiol.2010 Dec;21(12):1825-9. Schmidt A, Piorkowski M, Werner M, et al. First experience with drug-eluting balloons in infrapopliteal arteries: restenosis rate and clinical outcome. J Am Coll Cardiol 2011; 58: 1105-1109. Zhan LX, Bharara M, White M, Bhatnagar S, Lepow B, Armstrong DG, Mills JL Sr.Comparison of initial hemodynamic response after endovascular therapy and open surgical bypass in patients with diabetes and critical limb ischemia. J Vasc Surg. 2012 Aug;56(2):380-6. Söderström MI, Arvela EM, Korhonen M, Halmesmäki KH, Albäck AN, Biancari F, Lepäntalo MJ, Venermo MA. Infrapopliteal percutaneous transluminal angioplasty versus bypass surgery as first-line strategies in critical limb ischemia: a propensity score analysis. Ann Surg. 2010 Nov;252(5):765-73. Dosluoglu H, Lall P, Harris LM, Dryjski ML. Long-term salvage and survival following endovascular and open revascularization for critical limb ischemia after adoption of endovascular-first approach by vascular surgeons. J Vasc Surg. 2012 Aug;56(2):361-71.